The MOD® Reverb Tanks are high quality upgrade units. 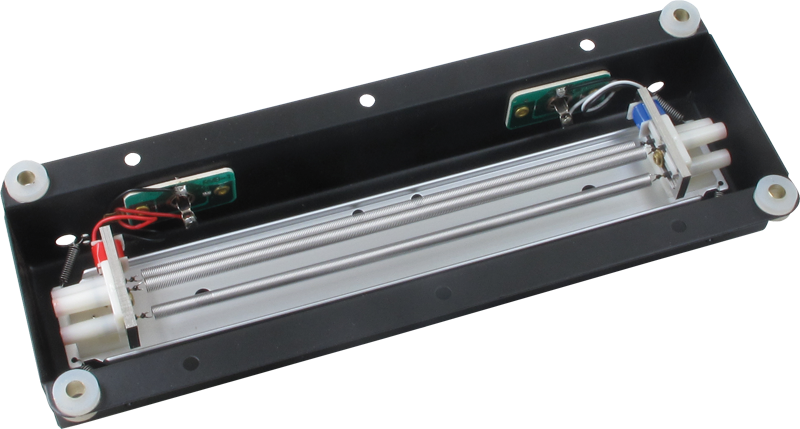 Some of the major differences between the MOD®s and other reverb tanks are that the Transducers are wired directly to their respective RCA jacks as opposed to current production tanks where Transducers are connected by a detachable plug to their respective RCA jacks. This makes the tanks less receptive to any outside interference. The original Hammond Accutronics tanks from the 1960s were also wired directly to their respective RCA jacks. In addition, very close attention has been paid to the spacing and size of the lamination of the Transducers resulting in a more vintage like tone. Questions about reverb tanks? See our tech articles for more information. Mounting Center Distance A 8.56 in. Mounting Center Distance B 2.81 in. Grommet Hole Diameter 0.2 in. Packaging Dimensions 9.4 in. x 3.4 in. x 1.6 in. 1 answers Is this part good for the valvestate 8080 model? Yes, this should work with your Marshall. 1 answers Will this fit into a Marshall MA50h? Are there bags for this tank available? This tank is listed as compatible with the MA50C but I wasn't finding info on it's compatibility with the "H" model. In terms of a bag the correct part number would be P-RBAG-9-A. 1 answers What are current reverb tank replacements for Marshall AVT50 combo? It appears that the AVT50 uses this reverb tank. I would confirm this by doing your own research. Most tanks will have a reverb number on it. 1 answers Need a new reverb tank for my Polytone mini brute. The tank code is 8DB2C1D. Is it okay to use yours? Yes, if your tank is a 8DB2C1D it will be compatible. 8DB2C1D is a common reverb tank used in many Marshall amps as well as other manufactures. 1 answers Will this tank work in a Marshall jcm900 head? From our limited research, the most common tank in the JCM900 is the 8DB3C1B. The 8DB2C1D is a similar tank with a medium decay, rather than a long decay, and a different mounting plane. We recommend the 8DB3C1B since it is designed to be mounted horizontally as opposed to vertically. 1 answers Would this tank fit a Marshall VS100R head? Yes, this should work with the VS100R. Unfortunately we do not have any resources on the JTM30. Do you have the original tank? Are there any markings on it? The best thing to do in this situation is take your amp to a tech. That way you can determine what your options are for hooking up a reverb tank to your amp. 1 answers Will this tank work in a Marshall jcm900 combo ?? I purchased this to replace the reverb tank on my Marshall Valvestate (Model # VS65R). I like the fact that itâ€™s wired directly to the RCA jacks because thatâ€™s where mine had broken. It is a suitable replacement at an affordable price. Thanks! Iâ€™m a very satisfied customer. Perfect form, fit, and function drop in replacement for my Marshall repair/refurbish. Shipped same day, received two days later in Cali. I'll be revisiting these folks for my next repair job. No regrets here.